Digital billboards are hardly new, but there seems to be some potential in the way Western New York Ford dealers will use them. When it starts to rain, the message changes. 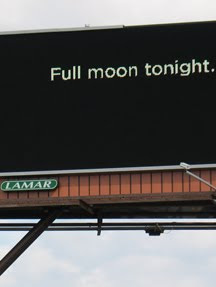 When there is a full moon, the message changes. When any number of 50 situations occur, the message changes to pinpoint the situation and deliver a situational message. "The boards allow us to talk to people about relevant local events, news and weather, while having some fun introducing the vehicle's features," said Chuck Basil, representative of the Ford Dealers of Western New York. "The new Ford Taurus is a very unexpected vehicle so we wanted our advertising to follow suit." That is what the campaign is about: It will introduce people to the new 2010 Ford Taurus, with western New York Ford dealers hoping to drive home the message that the car, along with the billboard messages, are "unexpected." While the creative thread is thin, the application has potential for both Ford and the future of advertising. "Advertisers are now able to change their messages as often as they want, set up their ads to run up-to-the-minute weather forecasts or even link to a Twitter or Facebook account updating the board's message almost instantly," says Todd Schaefer of Lamar Advertising. "The creative options are endless." While marketers are borrowing from their public relations, advertising, and corporate communication budgets to cobble together social media funding, social media is not replacing them. Situational communication is replacing it. We already know that the course of most communication is to steadily increase the impact of proximity (location) and demographics (population characteristics) thereby increasing the connection with the consumer. But what hasn't been fully explored, since the individual targeting featured in the film Minority Report changed too frequently to be scalable, is how technology could put us on the right path. Could you, perhaps, read this post on the bus stop shelter poster or duratran signage at the airport? And if not this post, then why not The New York Times, with a certain percentage of space saved for the content sponsor? And while e-reader technology is still not cheap enough to mass distribute devices today, we might ask why print publications haven't been exploring such options to deliver the distribution devices for pennies on the dollar and thereby eliminate distribution and printing costs. Right. For all the buzz from some publishers about consumers paying for subscriptions, most of them have forgotten that consumers never really paid for the paper. Advertisers did. Subscription prices barely covered the price for home delivery. So how does the 2010 Ford Taurus campaign fit into the picture? Digital publications could deliver digital advertising as situational as Lamar Advertising's outdoor concept, e.g., allowing an investment firm to deliver messages based upon the fluctuations of the stock market but only for those readers that meet a certain demographic profile. All it requires is for modern advertising creatives to stop writing for each other and return to their golden era roots, where copywriters once wrote as if they were writing to a single consumer (much like some social media pros do today). In fact, in our playbook, digital distribution would not only make this possible, but it would also make it a necessity. Leap forward already. It was rather interesting for me to read the post. Thanks for it. I like such themes and everything connected to this matter. I would like to read a bit more on that blog soon.